Any product on our website that is called a “poster” is printed on a high quality, offset lithographic printing press. Typically we print a run of 500 posters at one time. This type of printing allows for solid color ink (the ink is not made up of tiny CMYK dots like digital or ink jet printers are. Rather it is one color of ink matched to be the exact color we specify), offers extremely sharp image quality, and archival properties. 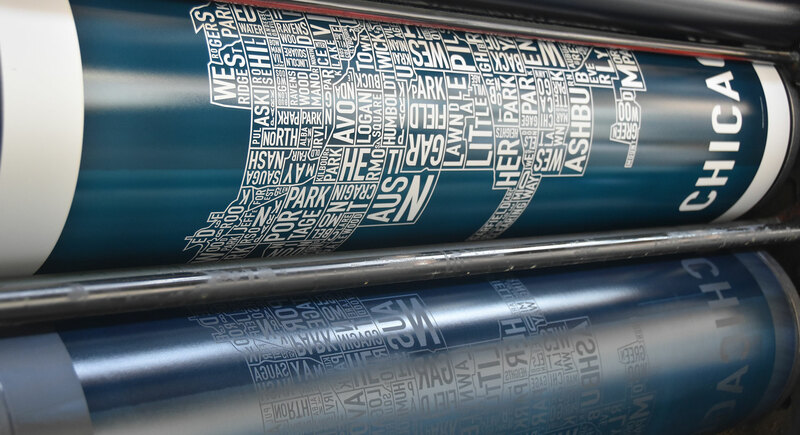 Chicago poster during printing – the ink “offsets” from the roller to the paper. Since the beginning of Ork Posters, we have worked with one offset printer here in Chicago, IL. The company is committed to respecting the environment by recycling all paper waste, using vegetable-based inks instead of oil-based, and promoting the use of post-consumer-waste, recycled papers. 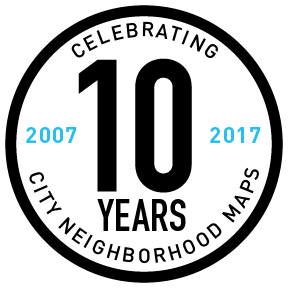 Since it began in the 1960’s, it has been an employee-owned company and has paid it forward by providing printing for countless non-profits and worker-rights organizations. Any product on our website that is called a “print” is printed by the silkscreen method. A screen made of silk is stretched on a frame, coated in emulsion, an image is burned in to harden areas where ink shouldn’t go through and wash out from the areas that it should. Then the ink is put on the top of the screen, the paper underneath, and as the ink is squeegeed across the screen, a very thin layer of ink transfers to the paper creating the image. The ink is water based, therefore the print is transferred to a drying rack to dry as the water evaporates, the ink sets and voila! Pulling the squeegee across the screen to transfer the ink to the paper underneath. This type of printing allows us to print bright or light inks on bright or dark colored papers because the ink dries on top of the paper and does not soak into it. 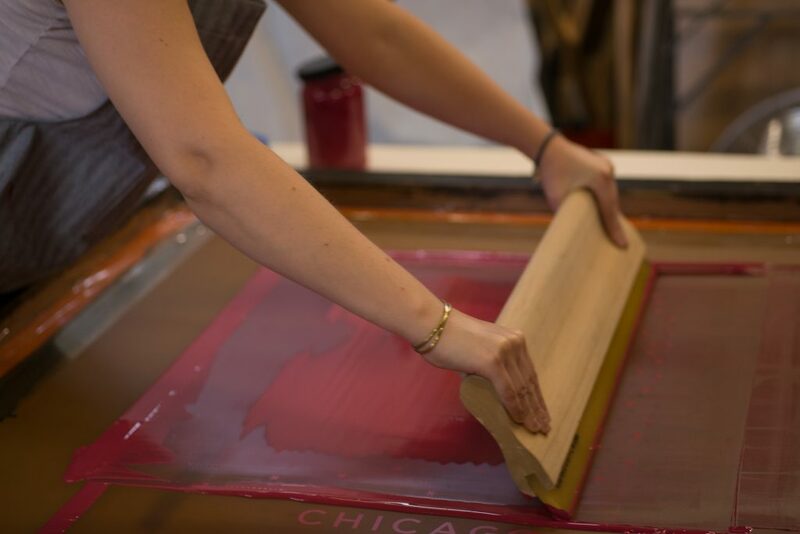 When Ork began, its founder, Jenny, learned to silkscreen at Screwball Press in Chicago. It was economical to print short runs of only 50 or 100 prints and did not require any large equipment investments, just blood, sweat and tears! As Ork’s popularity grew, she began outsourcing printing to several local screenprinters including Screwball Press, Sonnenzimmer, Ryan Kapp and Delicious Design League. In 2015, Ork set up it’s own in-house press room with a semi-automatic press (it mechanically pulls the squeegee across the screen) and now screen prints in-house.